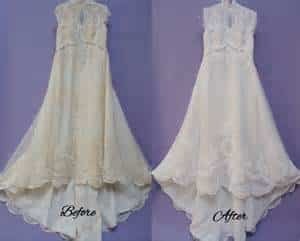 If the wedding gown of your dreams is a family gown that time has yellowed and is stained, call us. We specialize in restoring vintage gowns to their true color without doing damage to delicate fabrics or dyes, and our process removes stains and discoloration that ordinary dry cleaners cannot. You enjoy the wonderful feeling of using a family heirloom-a family wedding gown or one of the special dresses you or someone in your family wore as a child. Call today for your “FREE” consultation. You never know where you will find that special gown maybe in the back of a closet, attic or a vintage shop that you have been shopping at for along time.